The SubSonex touches-down on Wittman Regional Airport’s Runway 27 with Bob Carlton at the controls for the aircraft’s second flight on August 11, 2011. John Monnett (left) and Bob Carlton (right) pose for a celebratory group portrait with SubSonex JSX-1. The Hornets’ Nest R&D team is extremely pleased with the progress of the SubSonex Jet aircraft since first flight on August 10, 2011. Air show performer and owner of Desert Aerospace LLC Bob Carlton conducted the August 10th first flight, and remained in Oshkosh until August 14th, conducting several SubSonex flights before leaving for his next air show performance with the Super Salto Jet Sailplane. Bob’s flights continued to expand the envelope of the SubSonex as his comfort level with the ship increased. Flights explored low and high ends of the speed range. Speeds well-over 200 mph TAS were recorded, and Bob explored stalls, control authority, unusual attitudes and some basic, light aerobatics. Some of the highlights of Bob’s flights can be seen in the videos below. On August 25, 2011, John Monnett made his first flight in the aircraft. Several more flights have been piloted by John and his comfort level and confidence in the aircraft has grown tremendously. Hornets’ Nest R&D employee Drew Waterworth also flew the SubSonex on August 30th. John and Drew’s flights are also shown in the video footage available below. 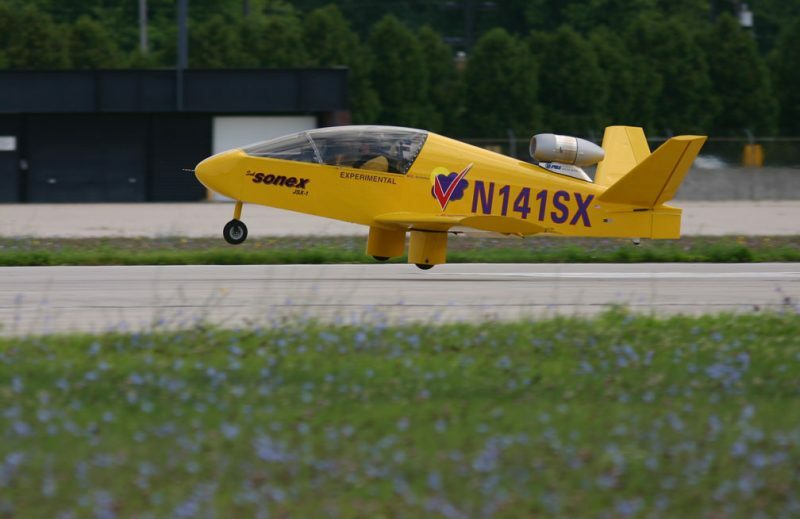 Although built to be a neutrally-stable, fun and responsive aircraft, like all Sonex Aircraft, the SubSonex is remarkably smooth and steady, allowing Bob, John and Drew to often fly “hands-off” for brief periods. Fuel economy of the SubSonex jet aircraft has also proven to be better than expected. Sonex Aircraft would like to extend tremendous thanks to Bob Carlton for all of his advice, expertise, and skilled test flying. Additional thanks goes to PBS, manufacturer of the TJ-100 engine, which has performed flawlessly on the SubSonex Jet. The TJ-100 has proven smooth, powerful, reliable, and incredibly easy to install and operate with PBS’s “plug & play” systems. More information about the TJ-100 can be found in our November 25, 2009 and December 23, 2009 SubSonex progress updates. Thanks also goes to MGL Avionics for their sponsorship of the instrumentation, including custom configuration of the MGL Flight II instrument to suit the SubSonex’s unique needs. Our thanks also goes to Wicks Aircraft Supply for providing a set of AveoFlash PowerBurst lights for the aircraft. Development on the SubSonex continues, as the Hornets’ Nest R&D team has recently completed installation of a retractable nose gear on the aircraft, intended to improve yaw stability in cruise and increase cruise speeds. A design study has also begun on the #2 prototype configuration of the SubSonex, which will allow for a larger cockpit, enhance the streamlining of the nose of the aircraft, and may feature a redesigned wing removal system for easier transport and storage. The PBS TJ-100 engine delivers smooth, reliable power that is easy to install and operate. JSX-1 uses an MGL Avionics Flight II instrument and the MGL V10 Com transceiver. AveoFlash PowerBurst lighting from Wicks Aircraft Supply has been installed on the SubSonex to make the small, fast aircraft more visible in flight. A prototype retractable nose wheel has been fitted to the SubSonex to improve handling at cruise and improve cruise speeds. A view of the cleaned-up fuselage of the SubSonex with nose gear retracted. The SubSonex uses a manual nose gear retraction system, shown here in the gear-up position. SubSonex JSX-1 looking mean on the taxiway centerline, preparing to head to the runway. Bob Carlton describes his experience in the SubSonex after first flight on August 10, 2011. The SubSonex on short final to Runway 27 during its second flight on August 11th. John Monnett talks to Drew Waterworth after his first flight on August 30th.